Early morning found us boarding the airplane from Lima, Peru to Pucallpa, where we would begin our boat transport up the Ucayali River deep into the Amazonian jungle for our quested encounter with the Sacred Brew, known as Ayahuasca, under the auspices of a Shipibo tribal Shaman. Pucallpa is a city of the Peruvian Amazon, a fairly decent sized city of 250,000 people. Its remote location, 3,000 miles up from the mouth of the Amazon River, gives it a frontier town flavor. Situated on Yarinacocha Lake and the Ucayali River, it is a port city of quite the regional hustle and bustle. Step outside the bounds of Pucallpa, however, and the image of an industrious area melts into the jungle foliage. Dense forests of underbrush and looming trees grow right to the river’s banks everywhere the water meanders and it meanders everywhere! Upon our debarking from the passenger plane at the Pucallpa airport we went immediately into town for a meal at a waterfront restaurant. Loud music blared while we ordered fish or chicken and rice, plantains or potatoes: typical jungle fare. The establishment was clean, bare-wood floored and set with red and white-checkered tablecloths. Some ordered tall bottles of beer, others the ubiquitous Coca Cola that is found throughout Peru. The full meal cost us each about 10 soles, or $3.00 US. Gilber, who was to be our boatman for the week, met us at the restaurant. Assistive and gracious he helped us carry our baggage, minimal though it was, down to the boat. We carefully walked down the firm mud of the shore of Lago Yarinacocha, there to scamper upon the prow of Gilber’s boat. A thing of beauty, this boat. Gilber explained how he had built it; cutting a large tree of the forest, sawing the planks and timbers from the cured log then constructing the frameless hull. A roof made of timber and tin followed. This was his fifth boat, he commented. The first two didn’t track so well, he slyly smiled. The current boat he’d used for plying his trade on the Ucayali River for the last five years. Gear loaded into the boat, we settled upon the plank benches, nestled upon our bags for comfort and cushion. The Evinrude motor at the back was started up. The unique arrangement of an extremely long shaft, at the end of which was the propeller, was pivoted-lowered into the water so that the churning of the blades was well behind the boat. This is a typical Amazonian design, I learned. It aids in maneuvering and keeps the turbulent waters far behind the boat. We, the Journeyers, 7 in total, thus set out upon our first water outing. Across the expanse of Yarinacocha we went for an hour and a half. We slowed, then tied off at the dock of our first night’s lodging. La Perla, The Pearl, is a Bed and Breakfast operated by Thomas Zirm and Rosaura Ruiz e Hijos. He is German, and settled in Pucallpa some 17 years previous, having found his bit of heaven and a wonderful wife from the local area. La Perla is entered through a stilt supported walkway that is an extension of the dock. Most of the walkway is screened in and roofed, in order to keep the pernicious insects from annoying one at any time of day or night. The B&B itself is likewise raised off the ground upon stilts, because of the seasonal rising of the Ucayali River. Built entirely of local timber, it has shutters that can close over the tightly screened open-air windows. Rosuara prepared meals to be envied. Breakfasts offerings were soft and rollable crepes with condiments of her homemade preserves of Amazonian fruits and berries, as well as a side dish of meats and fruits. Dinners were, once again, deliciously prepared meals of local produce and meats, with a hearty soup to fill the belly and sooth the palate. In the morning we all boarded Gilber’s boat and began our journey through the channels that led from Lake Yarinacocha to the Ucayali River. The Ucayali is a wide and strong currented river that flows down from the Andes, where it is known as the Urubamba. It is the same river that flows from Cuzco, past Machu Picchu and on into the Amazon Basin, where, as its character changes from a swift and tumultuous white water cascade into the sure and wide river of our transport, its name becomes the Ucayali. An hour and a half’s outing brings us to the plank dock of the Shipibo tribe’s village of San Francisco. We are met by a wonderful array of beautiful smiling faces of the women, while children happily splashed about at the river’s edge. While we waited in the boat Gilber went into the village and fetched the Ayahuascero Shaman who was to become our spiritual guide through the ceremonials of the next three nights. Gilber had pre-informed us that the Shaman, Carlos, by name, was a rather quiet type, and to please not seek to engage him in much conversation. Carlos, dressed in a cotton T-shirt and chinos, with sockless sneakers on his feet and a ball cap perched upon his brow, was the image of nonpretentiousness, an image that proved true to form as his character revealed itself over the next few days. All being settled in we leaned back into our daypacks and duffels, pulled hats over our eyes to shield us from the low-in-the-morning-sky Equatorial sun that peeped in from beneath the awning, and set forth through the channels to the Ucayali. Low hanging branches were brushed aside as we swept through the narrower passages, while macaws and parrots scattered at our approach. Ranchitos, small farms of the Shipibo and family enclaves of stilt born thatch roofed open sided houses were visible from time to time as we churned steadily through the waterway. Just as we were getting familiar with the passing scenery upon the channel’s banks Whoosh! Into the strong current of the Ucayali we catapulted! Turning to the right, and upstream, Gilber guided our boat across the river to the shallower current to be found there. About a half hour’s ride later Gilber slowed the boat to a halt, then pointed up into the trees near the river’s edge. Excitedly we began to ask “What? What is there?” as we peered in the direction of his gaze. A slight movement brought smiles as we say, high in the branches, an iguana lizard! Closer inspection revealed another 5 lizards, all sunning themselves upon the branches, their green coloration causing them to blend almost imperceptibly into the foliage about them. To our unaccustomed eye it seemed an amazing feat for Gilber to be able to pinpoint the presence of the iguanas from a moving boat. And yet, so familiar is he with the river and it’s every nuance, having been a boatman since youth, that he knows the residences and whereabouts of the many creatures that inhabit the river and its banks as easily as you or I might, in passing down a busy street, point out to a passenger in our car the location of the local panhandlers and cafes. While the chance to see wild iguanas in their natural habitat was thrilling, what came next was exhilarating: Dolphins! Now, not just any dolphins, mind you. These were the famous fresh water dolphins of the Amazon andŠ they are pink! Yes, pink dolphins cavorted around us, breeching, blowing and diving, swimming just off the bow of our boat as it made its way steadily upstream. The pink dolphins of the Amazon get their coloration from the shrimp they feed upon, just as flamingoes also get their pink color from feasting upon shrimp. It is easy to identify the older dolphins, as they grow pinker in color the more mature they get, the younger ones still being somewhat grayish. We were to see these dolphins from that point forth, as well as upon our return journey down the Ucayali. After another hour’s boating, and a few snores from nappers, Gilber’s nephew (and assistant) pulled out a bag and unwrapped lunch. Sweet miniature bananas accompanied a banana leaf wrapped piece of chicken hidden in a rice ball, spices delicately flavoring the whole. And, once we were finished, the remains, wrapper and all, went into the river, there to feed the fishes and be received back into the vast source and resource that is the Ucayali. Just try that with a McDonald’s wrapper! (No, please, don’t!). Soon after lunch our boat angles across the river once again and moved up a primary tributary of the Ucayali. The water was now a bit more turbid, latte’ colored with silt. We pulled to shore, there at the split, at the request of a few of us who needed, literally, to use nature in response to her call. Tall rushes, lush green and moist, lined the bank, while inland a few yards the bunch grass gave way to shrubs and tall trees. Nature’s call heeded, and a welcomed stretch of muscles sat too long, we climbed back into the boat and set forth up river once again. By this time it was apparent that Carlos was not quite as quiet as he had first seemed, laughing easily and asking us questions about our attire, hair styles and jewelry. Some of the ladies then offered to put some of the glitter they had sprinkled in their hair upon Carlos. He giggled like a teenager as his skin sparkled from their playful contribution to his appearance. Gilber and I struck up a conversation and very quickly established a camaraderie that was to continue throughout our time together. I learned of his life as a boatman, how he had come to know the river like the back of his own hand. He had begun, at five years of age, river boating with his father. The different seasons, times that brought rain and floods, or dryness and piranha infested pools, changes in river depth and configuration, all these he had come to learn throughout the last 40 years as he plied the river in his father’s, then eventually his own, boats. Gilber told of how, when a younger man, he built his very first boat. Choosing a tree from the vast Amazonian forest he girdled it, so that it might die then cure while upright. He came back a year later and felled the tree and dragged it back to be sawn into planks, then cut and fitted and finished as a river worthy boat. OnlyŠ it wasn’t! It did not track true, he said as he smiled in the memory of a young man’s first venture into the pride of making his own boat. His next boat was better, he said, but it too was not true. His third boat brought him great joy in its capability and ease of maneuver. We were fortunate to be cruising the river upon his fifth boat, the Normita. Onward and upward we slipped through the water. Suddenly Gilber shut the motor down and steered the rudder to cause the boat to take a sharp right hand turn. He pulled a long pole from off the roof and began to guide the boat through a narrow and winding stream. Using the pole to also move the overhanging brush aside, Gilber deftly floated our conveyance deeper and deeper into a wondrously mysterious jungle land of drooping flower laden branches, tropical birds singing and swooping above our heads. As it was my understanding that we were to make camp on the Ucayali itself, I asked the boatman “Gilber, have you ever been here before?” He turned and simply gave me a sly smile. Once we had navigated the slim waterway and come out once again into a river, I asked him where, and on which river, we were now. He again smiled, then sat down and explained that the river now twisted and turned a bit. He, and other boatmen, came here in the dry seasons when the river was low, hacked away the canopy with machetes and scraped a shallow channel between bends of the river. When the river rose the rushing water would carve the scrapes into secondary canals. Alleys. They made alleys in the jungle! 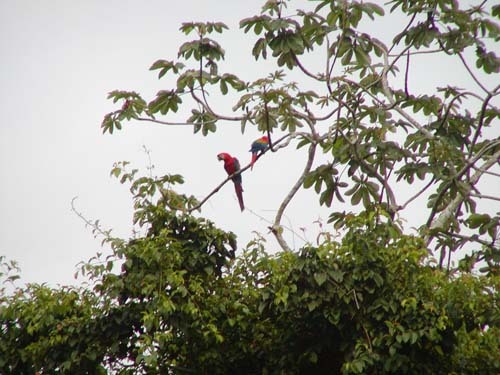 We continued to make passage through a series of alleys and river ways, Gilber slowing down before a bend to prepare us for a troop of monkeys that he knew lived just ahead, or an area well populated with macaws, bright red and blue in their feathery splendor. 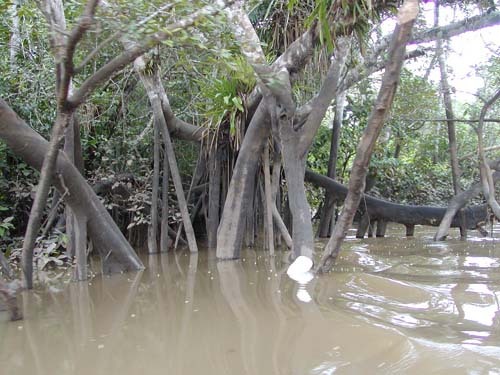 One particular place of note was a tree at the river’s edge, a banyan, its tentacled roots and branches creating a basket-like weaving of nooks. Gilber explained that it was in this tree that the local Shipibo would place someone who had become a concern or threat to the safety of the village. They were left in the tree, with food, for up to two weeks, there to be embraced by the Mother Tree, as he called it, until the errant person had, in the Mother Tree’s embrace, returned to sanity. Late afternoon brought us to an indistinguishable (to us non-Amazonian travelers) pull off. The boat was tied, we departed and were told to grab our personal gear, as this was to be our camp for the night. We scrambled up the slippery mud slope, lending a hand to each other with gear and in case of a not infrequent slip of the foot. Gilber and his son-in-law, Roberto, were kind enough to take their ever-useful machetes and carve steps into the bank, making our second and third trips much easier. Machetes, again, were used to mow down the weeds and brush, clearing away the flat spot of our intended campsite. Poles were then cut from the surrounding jungle and a framework was built form which to suspend our mosquito netting tents. It was during the building of this framework that I noticed that they did not dig holes for the placement of the uprights. The men simply lifted the poles a couple feet off the ground then let gravity and a slight push downwards drive the poles into the moist earth. Nor did they encounter nor remove any rocks. I looked around and also reviewed all I’d seen that day and realized that I had not seen even one rock! There is a distinct absence of rocks in the Amazonian basin. All the available land is compacted silt, washed down over the millennia form the Andes far, far upriver. We had no dinner that night. Our guide, Alan (who does an exquisite job of logistical arrangements on the Peruvian end to make our journeys go with ease), suggested that we should refrain from food, or eat but lightly, throughout the afternoon, as we were to partake of the Ayahuasca brew that very evening. Alan took us upon a tour of the surrounding forest, pointing out the large trees hung with liana vines, plants to avoid and areas to sit in silent contemplation. When, a bit later, we had all wandered back to camp, the tent was up and the men were sitting smoking tobacco in the afterglow of a day’s work well done. Suddenly Gilber jumped up, grabbed a large dry leaf and scurried off bent low to the ground. He walked back to our group, sitting upon a log, and displayed a large black beetle. This beetle, he declared, would not kill you if it stung you, you would only wish it had! ‘Nuff said. Sundown arrived. A few of us gathered, facing west, and sang the Song of Appreciation. A beautiful splash of color greeted us as we let be released the weariness of the day, the overwhelm of activity, the long ride upriver. As we let these things go a wave of tranquility washed over us. Ahhh! A new day was begun in appreciation, just as the day gone by was released with appreciation. We sat, smoked tobacco, laughed and reminisced of our journey so far. Some explored further the jungle about us, never straying too far from camp. 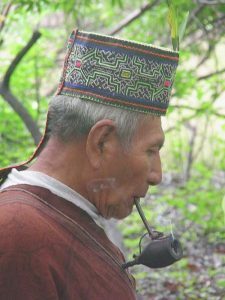 We were each, in our own way, finding a way of dancing with the portent of what we were, by choice, about to embark upon: an Ayahuasca Journey.